The movie version of Marjane Satrapi’s graphic novel Persepolis is playing in a couple of theatres in the city, including the PVR in Saket’s Select Mall and the pointlessly named PVR-Europa in Gurgaon. (I think Europa was originally meant to screen non-mainstream European films, but those plans were quickly discarded.) I saw the film last week and enjoyed it. 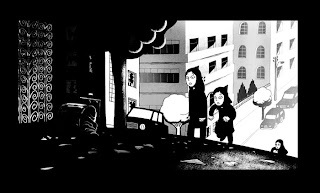 It’s a joint adaptation of Persepolis: The Story of a Childhood and its sequel Persepolis 2: The Story of a Return – the first book tells the autobiographical tale of a young Iranian girl growing up in the shadow of the 1979 Islamic revolution; the second is about Marjane’s stay in Austria, where her liberal parents sent her at the age of 14, her return four years later to her home country, and the difficulties she faced as a young woman dealing with repression and social hypocrisy. The film is co-directed by Satrapi herself and voiced by the likes of Catherine Deneuve, Sean Penn and Gena Rowlands. (I saw the English version. In the original French version, incidentally, the role of Marjane’s grandmother was voiced by the veteran French actress Danielle Darrieux, who is well into her 90s now.) 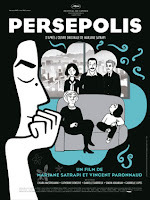 Satrapi has done a fine job of transferring her drawings and script to another medium, but a word of caution for viewers whose expectations may have been heightened by the advances in movie animation: Persepolis – in both its written and filmed avatars – is driven more by content than by form. In the books, Satrapi’s drawings are simple, black-and-white woodcuts that are mostly concerned with advancing the narrative. They also follow a conventional rectangular-panel arrangement, rather than the complex, multi-layered storyboarding that you’ll find in many modern graphic novels. The film has a similarly uncomplicated structure. But this also means that the carefully selected occasions when Satrapi does experiment with style are all the more effective. The books pick their dramatic moments very well and I thought this translated to the movie, which has moments of inventiveness that are very forceful: for instance, a key scene from the first book, where young Marjane sees a disembodied foot in the rubble of a neighbour’s bombed house, has been given an Expressionist twist here, with Marjane’s features – her face frozen in a silent scream – melting until she resembles the screamer in Munch’s famous painting. This is followed by a very slow fade to black, perhaps indicating that the episode marks the end of innocence for this young girl, the beginning of a new chapter in her life. There is also some interesting use of charcoal drawings (which weren’t in the books) for backgrounds. And certain elements of the story are more effective in movie form than they were on the page – such as the use of western pop songs like “Eye of the Tiger” as a pointer to Marjane’s rebellious nature, and the burlesque series of panels that depict the physical changes in Marjane (giving us a short-cut for her metamorphosis into a young woman). Naturally, the 90-minute running time means that a few sub-plots have had to be sacrificed, but nothing of great significance has been cut out. A certain amount of simplification was inevitable. Perhaps keeping in mind her global viewership, Satrapi has made the cultural references more accessible in places: in one scene, after Marjane returns from Austria, a wide-eyed family member mentions The Sound of Music and the Von Trapp family, and asks her if she met Julie Andrews; in the book, the question involved the Austrian actress Romy Schneider. The darkness of its subject matter and the relative simplicity of its animation necessarily means that Persepolis won’t be to all tastes. (I also think this film might have greater appeal for viewers who haven’t read the books. For those who have, it can get repetitive; a faithful animated movie version of a comic book can’t bring too much new to the table.) Also, Persepolis tends to drag a little towards the end – the story of Marjane’s unsuccessful marriage and the events that led to her leaving her country for a second time were never all that exciting in the book either. But there’s nothing to fault in the first three-fourths of this film. 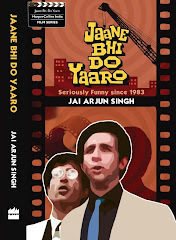 Like its source material, this is a work of intelligence, sensitivity and humour, driven by a very likable protagonist. Before our eyes, Marjane moves from being a confused girl to a headstrong young woman – occasionally too impetuous for her own good, but always learning from her experiences, and willing to see the lighter side of a life lived in painfully exciting times. I loved reading Persepolis 1, but Satrapi's output since then has been of diminishing returns. And making an animated version of a graphic novel while maintaining its signature style, seems to me rather pointless. That said, I will definitely watch this. It jut got released on home video. There was some controversy that it never got nom-ed for Oscars this year for best foreign film. I was very disappointed with the movie. I think the book set very high expectations for me. My issue was that the movie is not easy to follow for people who haven't read the book. It seemed as if the movie picked out all the 'key' scenes from the book but had a hard time creating a flow.